In this article, we will explain how to communicate to an external EEPROM from the AVR Atmega32 MCU using the I2C communication protocol. 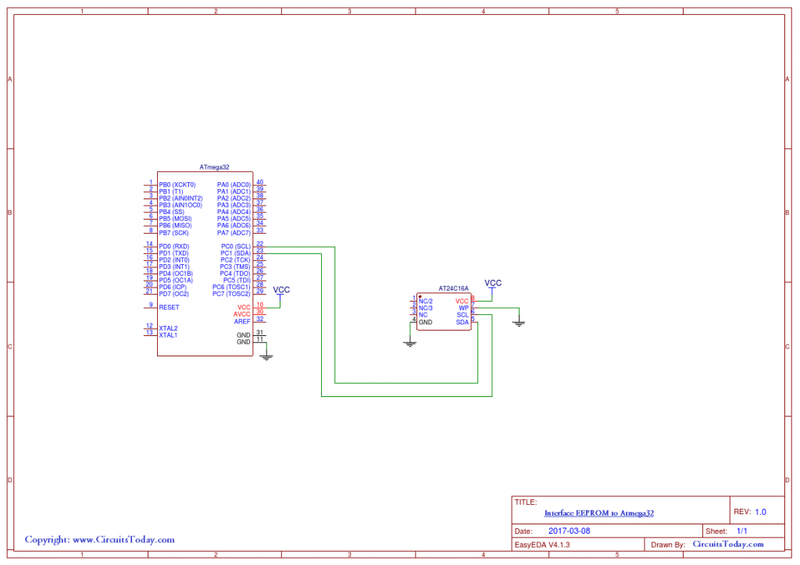 So let’s begin our tutorial on how to interface an EEPROM (AT24C16A) with AVR Atmega32. You will usually need an external EEPROM when your system has a certain set of user configurable settings that you need to save even when the system is powered off; so that the system starts with these configurations the next time it is powered on. In this case, using an external EEPROM gives you the advantage of having a larger storage space (than the internal EEPROM inbuilt in Atmega32) inÂ addition to keeping the user configurations safe from being lost even if the MCU fails. 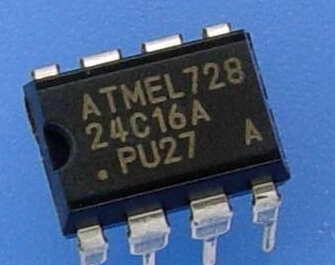 In this article, we will use the Atmel EEPROM AT24C16A. It is a 16K bit memory organized as 2048 word of 8 bits each (2048 Byte). It has 8 pins as clarified in the pictures below. A0, A1 and A2 pins should be left unconnected for this specific EEPROM.The below drawing shows how to connect its pins to the Atmega32 I2C pins.Â You must make sure that pin 7 (WP is connected to ground) as this pin is a hardware write protection which wonâ€™t allow any writing operation to the memory unless it is grounded. I2C is a bus interface connection incorporated into many devices such as sensors, RTC (Real Time Clocks), and EEPROM. It is also referred to as Two-Wire Serial Interface (TWI) and it is ideal for communication between low-speed devices for a reliable communication over a short distance. 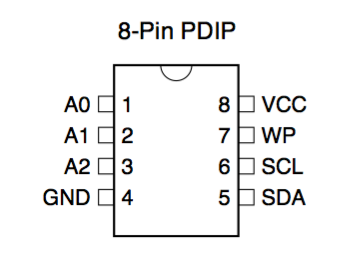 The I2C protocol uses only 2 pins, one for clock (SCL) and one for Data (SDA). In Atmega32, these pins are pin22 (SCL) and pin23 (SDA). They are multiplexed over the I/O port C pins 0 and 1 respectively. So, we will first configure and start the I2C protocol with the AVR microcontroller, and then we shall learn how to communicate with the EEPROM. In order to activate the I2C protocol, In master mode, on Atmega32, you need to configure 3 registers: TWBR, TWSR and TWCR. Â We shall use the TWCR register again (at a later stage in this tutorial) to operate the communication. Where (TWBR) is the value in the TWI Bit Rate Register and TWPS is the value of the 2 bits (TWPS0) & (TWPS1) in the TWSR register which will be explained next. For the purpose of this exercise, we will put the value 0x07 in the TWBR register. In this article example, we shall clear these 2 bits to Zero. This 7-bit register is used to control the operation of the TWI.Â For now, we only need to set the TWEN bit (bit2), which enables the I2C module and overwrites the I/O functionality of its pins (Port C pins 0 and 1). Taking control of the TWI bus, by sending a start signal to it when it is free. Stop transmission and Release the TWI bus. We shall explain these steps in detail below. For the MCU to be a master on the TWI bus and take control of it, the MCU senses the bus until it is free, and then sends a Start signal. Having done so the MCU seizes the bus and no other device can send data until the MCU releases the bus, to avoid data collisions. After that, the MCU can start sending data. In this section, we will write a function for the MCU to be a master on the two-wire serial bus. Set the TWEN bit in the TWCR register to ensure I2C is enabled. Write 1 to the TWINT bit in the TWCR register to clear the interrupt flag. This bit is set to 1 by the hardware when the I2C module finishes its current job and is ready to get more commands from the SW. Also clearing this bit starts the I2C module immediately. So every time we want to start the I2C module, we must ensure clearing this bit first and we shall poll till it becomes 1 again because this indicates the I2C has successfully executed the task. Note: that this bit is never cleared by the MCU Hardware, you must clear it by Software. Write 1 to the TWSTA bit in the TWCR register. Setting this bit makes the MCU send a start signal on the bus when it is free, to declare that MCU is currently controlling the bus and will start transmitting data. Poll the TWINT bit (previously cleared) until it becomes 1. Once this bit is set, it means that the MCU has successfully taken control of the bus as a master. *To poll a bit: is to start an infinite loop that exits only when the bitâ€™s value changes to the value we want. This is demonstrated in the code below. #define get_bit(reg,bitnum) ((reg & (1<<bitnum))>>bitnum) // get bit macro used to get the value of a certain bit. Put the data you need to send in the TWI Data Register. Write 1 to the TWEN bit in the TWCR register to ensure I2C is enabled. Write 1 to the TWINT bit in the TWCR register to ensure it is cleared. Poll the TWINT bit (previously cleared) until it becomes 1. Once this bit is set, it means that the transmission is complete. Poll the TWINT bit until it becomes 1. Read data from the TWDR register. Write 1 to the TWSTO bit in the TWCR register to send a stop signal and release the bus. Now we have seen all the necessary functions to start and operate the I2C on Atmega32, letâ€™s see how we will use that with the EEPROM. Take control of the I2C bus. The next 3 bits represent the memory page number. Send the memory address to read from. Receive the data read from the EEPROM. Send stop signal to release the I2C bus. Now, Letâ€™s put all the pieces together! The below program combines all the functions we wrote above and uses them to write a value to the EEPROM, retrieve it again, compare the retrieved data to the written one and light a green LED if they are equal (which should be the case). Â Â Â Â Â Â  TWI_Write(0xA8); //slave address is 1010.100 and a 0 in the 8th bit to indicate Writting.